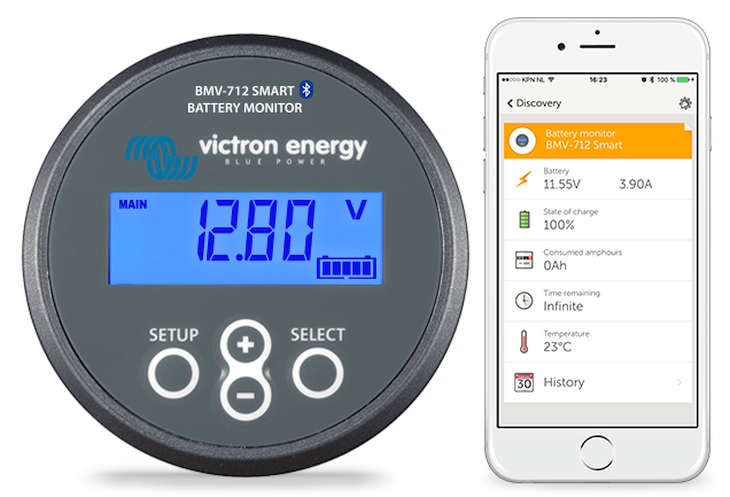 The BMV-712 Smart battery monitor has to be one of the most eagerly awaited of Victron’s new products – and it is now in stock! Here’s what Victron Energy Distributor Energy Solutions (UK) Ltd., have to say about the BMV-712 Smart. “We have been lucky enough to receive our first unit of the new Victron Energy BMV-712 Smart Battery Monitor. The BMV-712 Smart is the same battery monitor as the BMV-702 but with the addition of Bluetooth connectivity built into the unit. No longer will you need the Victron Bluetooth Dongle to access the Victron Connect app – it is already integrated so you can easily view the device from your smart phone or tablet. Victron has started to integrate Bluetooth connectivity into a large number of their current products, including the new Smart Solar MPPT charge controllers. Once you have download the VictronConnect app you will be able to customise the settings on the BMV-712 Smart as well as completing it’s setup – all of which we found very quick and easy. All data monitoring can be completed on one screen including the state of charge, battery voltage & amps, temperature, and time remaining. All of this data is then collected and stored historically for later use – which is great for seeing how your battery bank performed over time. This will also allow you to connect to the internet for software updates and to update with new features as and when they become available. I have two BMV-702 monitors on my electric propulsion sailing yacht below decks, both with battery temperature readouts. Whilst the domestic battery bank only needs checked for SOC occasionally, I do need to have a real-time readout of the propulsion bank in the cockpit whilst sailing, to monitor power usage of the motor. Presently I need to use my smartphone via 4G or the local LAN to do this – but now we have the BMV-712 Smart it’ll be much quicker and easier to use the VictronConnect app instead. Both battery monitors though will still be connected to my Color Control GX and logging data to the VRM too. Time then for an upgrade to get the best of both worlds – and with no need to plug in a Bluetooth dongle separately to check for firmware updates. All in all, good reasons to upgrade. You too may have similar reasons to upgrade? What a terrific product – I’m ordering one!